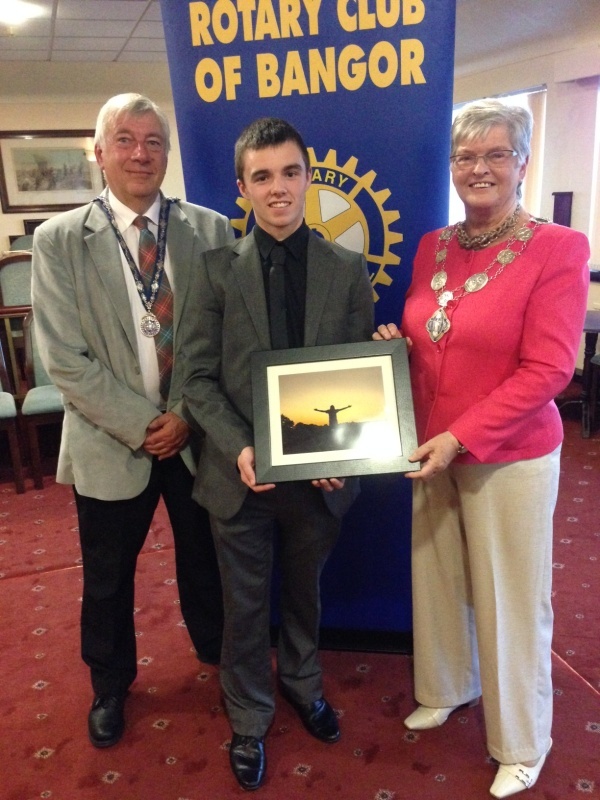 Deputy Mayor of North Down, Alderman Anne Wilson, was on hand to congratulate Ben Watson who was the outstanding winner of the Rotary Club of Bangor’s Young Photographer of the Year Competition. Anne, who chose not to stand for re-election in the recent Local Government Elections, told members of her experience as a Councillor on the North Down Borough Council over the past 20 years. But it hasn’t been two decades without challenges and when asked to cite her most frustrating experience the Alderman talked about the Council decision to build a Gun Club into the new community building planned for Hamilton Road. After some questions and answers the Deputy Mayor was pleased to present Ben Watson with his prize as the Rotary Club of Bangor’s Young Photographer of the Year. His prize consisted of cash and a framed print of his winning photograph courtesy of Sonia Lilley and Kodak Expresson Bangor’s Main Street.